Ok, look. We all know that Mike's the fun guy around here. You don't need to tell us. We know that he invented this whole Friday Fun Day (#FFD) thing to begin with--not to mention the fact that he wrote the infamous "Fun with Paper" and "Son of 'Fun with Paper'" blog posts right here on the Launch Pad. He's taught the whole Foundation how to love LOLSpace, and let you crazy people decorate his office with all kind of fun and strange artwork. But with Mike out of commission for the week--he's in Joshua Tree National Park, and isn't even active on Google Latitudes!--Nicky and I are doing our best to pick up the slack with a Friday Fun Day activity of our own. We're excited to see what all of you cook up. 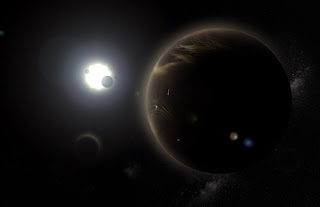 So, today's activity: via Twitter or via the comments on this blog post, please submit your favorite works of space art--the kind of things that you would make your wallpaper or screen saver. 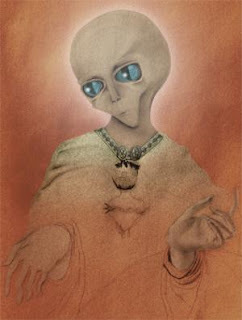 These can be original creations, things found in the wild (attributed where appropriate), or actual pictures. They can be drawings, pictures, sculptures (if you can find a way to cram those into your internets without clogging up the tubes), CAD drawings, or just about anything else. The rules are simple: keep it spacey, tell us why you like it, and give credit where credit is due. Will and JB fight the Space Dinos, original artwork. This one was specially created as a gift for me from my lovely or fiancée(I know, I'm insanely lucky). There's a lot of back story and inside jokes there, obviously, but the main theme is clear: my dog and I are in an a space ship fighting against an alien menace of Robo-Dinosaurs. I think this pretty much speaks for itself. 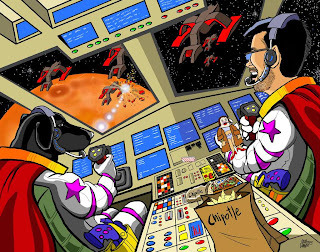 Space Mall, original artwork. This was also a present--to Nicky from her roommate upon Nicky's graduation for her Masters program. It's a bit hard to read the label at the bottom, but it would appear that this was original art by "Lynor Barry," made for a magazine (anyone know which?). 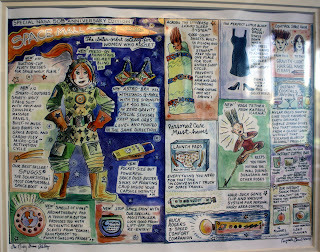 It's a pretty funny portrait of a future astronaut, with some fairly risqué themes. CLick on the image to expand, and you'll be able to read the text. Untitled, original artwork. Submitted by @Gonz037, who notes that it's still a work in progress. Looks pretty awesome to me! Great work, Gonz037--and I hope you finish it up sometime soon! Solar eclipse on the Moon, original artwork by W. Kranz. Submitted by Paolo Amoroso, who has pretty much reached legendary #FFD status. Paolo found the work in L’Universo Stellato, an Italian translation of a 19th century coffee table book by German astronomer Max Wilhelm Meyer. Two quick thoughts--first, this is great coming just on the heels of this photo from the Japanese lunar probe, and secondly, wouldn't it be great if W. Kranz was an ancestor of Gene Kranz? 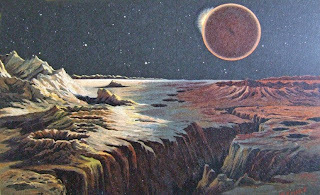 Image removed by requestSaturn As Seen From Titan, original artwork by Chelsey Bonestell, 1944. Submitted by @Quarkspin. I'm a sucker for Bonestell, I'll admit. I was extremely excited when the folks who control his estate donated original artwork to serve as part of the actual award for winners of the Todd B. Hawley Memorial award, given out by the ISU-USA Alumni Association. JEALOUS! You can find more Bonestell greats here. The Gathering, original artwork by Joseph M. Barone. Submitted by the artist himself (on Twitter as @joebarone). A stunning peice Joe created for an Art Direction class. Joe submitted three very great peices for this--look through his Twitter stream!--and also passed along a link to a space art blog he runs called It's Full of Stars. Well, there goes my productivity! Great stuff, Joe! You can also see some of his non-spacey stuff on his design website. Via @Supernat, We get a link to a YouTube video of artist Enrique Morales making a spacescape with spray paint. Sadly, embedding isn't allowed for the video, but please click through and give it a watch! It's great fun to watch the creative process via video. 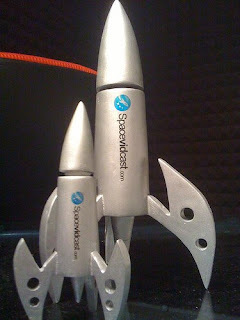 Bubble Rockets, original sculpture. I asked for sculpture, and @cariann obliged! She notes that "MomDog had these made for us for Christmas. I love them... so much, I don't want to give them away. I don't need them as a desktop pic because they are right in front of me. Not even meaning to self advertise... I just think they are AWESOME!" Awesome work. I'd expect no less from the great SpaceVidCast crowd! Erika Vick (@egvick) passes along a link to a really cool NASA web application called Copernica. I don't know how I've never seen this before--it's really awesome! If you've got Java installed, I can pretty much guarantee you'll find Copernica to be a fun way to browse some space imagery. Untitled, original photograph by Mark Rigby. Another find from @amoroso. 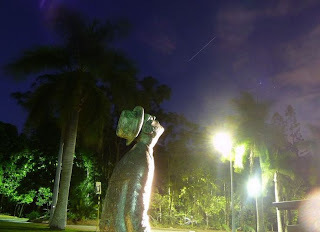 It's described as "a bronze statue of Konstantin Tsiolkovsky, the Russian Father of Cosmonautics (outside the Sir Thomas Brisbane Planetarium), watch[ing] the International Space Station in the sky above Brisbane, Australia, during the evening twilight on October 17, 2008. 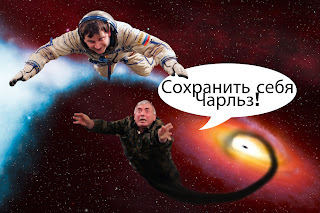 Onboard was Richard Garriott who had launched on a Russian Soyuz rocket five days earlier." Great composition, Mark! Untitled, original photography courtesy of NASA. You don't often get to see the Shuttle from this perspective! 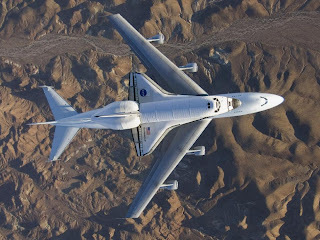 Space shuttle Endeavour hitches a ride home on board a 747 after the STS-126 mission late last year. Silly Endeavour, didn't your parents tell you not to hitchhike!?! Seriously, though, awesome photo--thanks to @snibble for passing it along. Save Yourself, Charles!, original composition by Dave Mosher. If you haven't already bookmarked Space Disco, you need to. Like, now. We'll wait. Dave has some great reporting and feature story journalism, but isn't afraid to have a little fun, like with his "Space Fark" photoshopping contests. I was happy Dave submitted this one--it's one of my favorites. 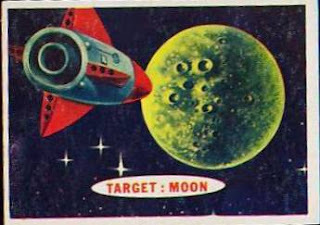 Target: Moon, original artwork from a Topps card collection. @Quarkspin passes along this blog post with tons of cards from this series. Awesome--I had no idea these existed. I've decided that I'm pretty much just going to use this image instead of a slide deck next time I talk about the Google Lunar X PRIZE. I mean, it pretty much says it all, doesn't it? 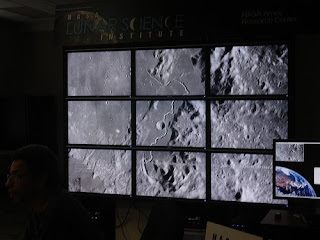 Hyperwall, original photograph courtesy of the NASA Lunar Science Institute. OK, I'll admit that I did't actually really know what a hyperwall was until I just Googled it right now. But I'm pretty darn confident that if I had one, I'd use it to show off cool pictures of the Moon, like the staff at the NASA Lunar Science Institute (@NLSI) did. That's right, 64 million pixels and 55 square feet of beautiful Moon, awwww yeah. Eve worry that NASA doesn't do cool stuff anymore? Well, don't be. Untitled, original photograph by Alessio Eusebio. Alfred Hitchcock, eat your heart out. The Vehicle Assembly Building is one of the largest buildings in the world, with an enclosed volume of 3,665,000 cubic meters. By that logic, we can easily calculate the size of this bird as ... let's see ... carry the one ... ah, I've got: really, frighteningly huge. I expect this Bird to headline the Weekly World News or National Enquirer within the next week or so--give all credit to @amoroso for passing this along. 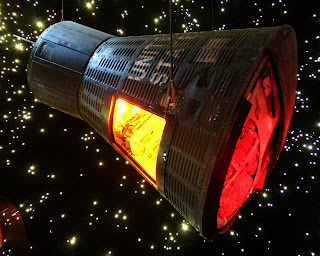 Gordo Cooper's Mercury Capsule, original photograph by @_OM_. As explained on @_OM_'s webpage, "This is a shot of MA-9A (AKA Mercury One-Day Mission, or MODM), the spacecraft Gordo Cooper flew into space in 1963 for 22 orbits. Taken shortly after Chrisnukkah 2004, it's part of a series of images taken during two trips to Space Center Houston, the Disney-run non-free visitor's center. Originally, I was going to put this in my Photo Gallery as a preview of more images to come, but everyone who's seen this before putting it online claims it's possibly the best photo I've ever taken with regards to clarity, composition, and color ranges. Who am I to argue with critics who have a clue?" Untitled, original composition by @amoroso. Seriously, I think I should just hand over my Friday Fun Day keys to Paolo. This piece generated a number of digital oooohs and aaaahs after Paolo posted it to Twitter earlier today. It's a composite of a couple of photos--particularly poignant because, as Paolo pointed out, the crew of Gemini 7 (the spacecraft in the piece) did indeed go on to orbit the Moon as part of Apollo 8. Untitled, original photo by @flyingjenny. Jen notes "I didn't see any fiber arts [in the Friday Fun Day collection thus far], so here's a photo of an 'artwork' that I carry all over KSC every day." 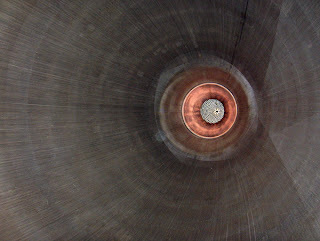 For those of you keeping score at home, yes, that is indeed the interior of a Space Shuttle Main Engine nozzle. nd it does indeed look beautiful--a worthy entry on many levels. On a side note: @flyingjenny carries SSME nozzles around all day? Remind me never to mess with her!!! (Update: It turns out the streams crossed and Jenny's quote was about another picture--this one. That makes about a million times more sense. 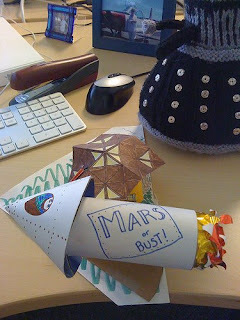 Though I do think that @flyingjenny works on the SSMEs, so maybe... just maybe... naaah. Well, that brings us to a close, friends. Thanks to everyone who participated by sending in some art, creating their own art, retweeting, or just passively enjoying. Tune back in next week, when Mike will take back over. In the meantime, I hope you'll poke around the rest of the Launch Pad and the Google Lunar X PRIZE webpage, if you're new here, and let us know what you think! MomDog had these made for us for Christmas. I love them... so much, I don't want to give them away. I don't need them as a desktop pic because they are right in front of me. Not even meaning to self advertise... I just think they are AWESOME! One of my favorites is the one of Gordon Cooper’s launch from May 15, 1963 (MA-9) that Bob McCall did….the original is hanging on my wall here at NASA. 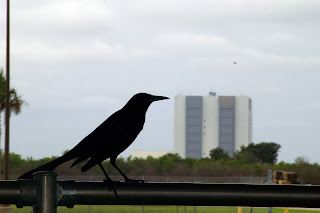 I remember as a small boy seeing it when I would visit the NASA Johnson Space Center in the 60’s and 70’s. When I came across it in a warehouse several years ago, I couldn’t believe I was seeing it again after 30 years…and quickly got it into my office. I LOVE THIS PAINTING!!!!! Earth rise. I couldn't choose just one. Many Chesley Bonestell illustrations at the site of Famio Feminò, which includes tons of space art. Thanks to all who appreciated the Lunar Gemini composite, which is based on NASA photos S65-63188 (Gemini 7 seen from Gemini 6) and AS15-97-13252 (Apollo 15). 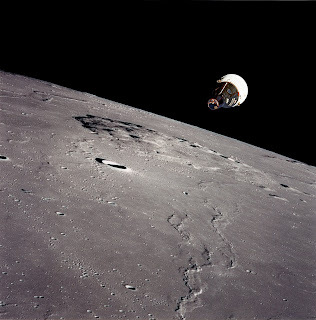 I encourage you to learn more about the Lunar Gemini concept. Just to follow up -- I went through the QuarkSpin archives to look for my TOPPS Target:Moon trading cards. Sure enough, I have 12 of them that I've managed to hang on to all these years. Wow. I just wanted to take this opportunity to thank Will and Nicky for hosting a fantastic Friday Funday #FFD while I was out of town. This really surpassed my expectations, and the art you guys submitted is incredible. i like this site!!! Its fun and im all about space.. But U said to give credit where credit is due... Right? Well on ur site u have a link to you-tube, enrique morales- this guy is using another artists music and his performance.. The reason why u cant comment on this video is because of the BASHING made on the video.